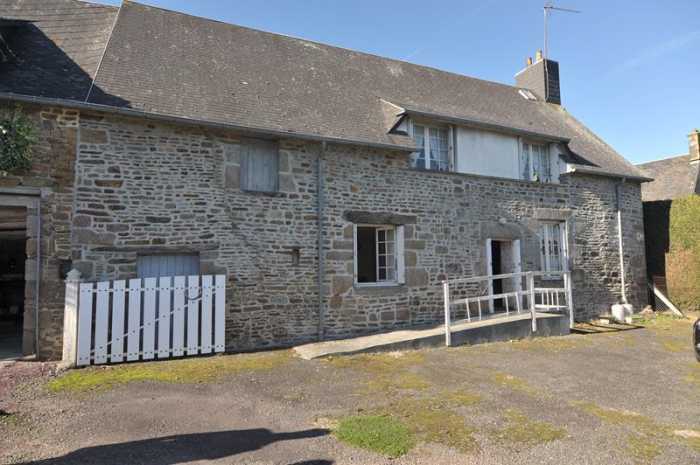 Properties for sale in Normandy, France - AHIN-SP-001123 Nr Vire 14500 Stone house to modernise in quiet hamlet with almost half an acre of garden and several outbuildings. The property is situated about 8kms from the town of Vire with all amenities including mainline train station to Granville and Paris (approx. 2 hours 40 mins), Supermarkets, Schools, Bowling, 18 hole Golf Course, Lake, Swimming Pool, Skate Park, Gym, Riding School, Hospitals, shops, etc. Market day is Friday. The beach at Granville is approximately 50 minutes away. The ferry ports of Caen (1 hour), Cherbourg, St Malo and Le Havre are within easy driving distances and Calais for the Tunnel is about 4 hours away. The nearest airports are at Deauville (Cityjet), Rennes (Flybe) and Dinard. Kitchen/Dining Room 5.85 x 5.39m Partly glazed door to rear (west) elevation. Tiled floor. Granite fireplace. Exposed beams. Cupboard housing electric meter. Sink unit. Window and door to front (east) elevation. Cupboard under window. Convector heater. Telephone socket. Door to stairs to first floor with cupboard under. Lounge 5.24 x 3.46m Window to front elevation. Tiled floor. Convector heater. Utility Room 2.47 x 2.18m Window to rear and north elevations. Tiled floor. Space and plumbing for washing machine. Bathroom 2.61 x 1.34m Fully tiled. Hand basin. Bath with mixer tap/shower fitment. Extractor. Convector heater. Bedroom 1 4.70 x 3.57m Window to front elevation. Built-in wardrobe. Oil filled electric radiator. The garden to the front of the property is enclosed and has flower beds. To the rear there is vehicular access via double PVC gates and garden laid to lawn and enclosed by hedges. Orchard. Attached to the house is a shed/storage room 5.72 x 3.56m with concrete floor and door to the front. Hot water cylinder. Timber Garage under corrugated iron roof. Attached Barns constructed of corrugated iron with Fibro cement roof. Separate Detached corrugated iron/stone barn with corrugated iron roof. Mains water, electricity and telephone. Broadband available. Drainage to a soakaway. Electric heating.